Wishing you many birds and spectacular bird moments in 2018.
p.s. 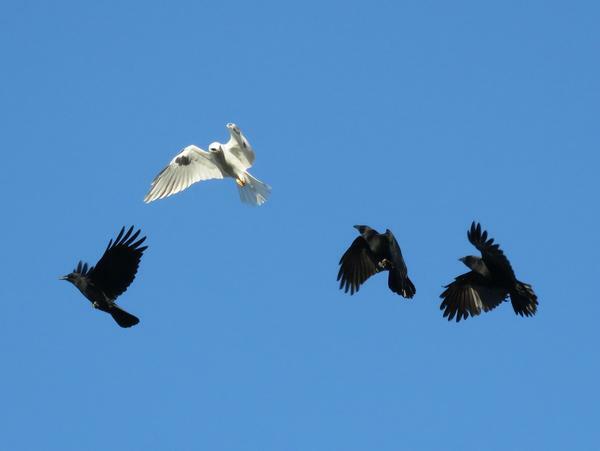 This photo of crows chasing a white-tailed kite was taken by “stonebird” in October 2017 at Ballona Wetlands, Los Angeles, California. What a thrill! Had a visit from Sharp-shinned Hawk yesterday! He was keeping an eye on my bird feeder! He hung around for apex. 30 min. Happy New Year! Hope it brings you a year of new birds to see and enjoy!